the screenplay on spec, in other words for free!" During a recent screening in Las Vegas for the film, one of tonight's Oscar winners Graham Moore told us about his experience writing the screenplay for such an important story. Allen Leech & Graham Moore, Vegas industry screening, "The Imitation Game"
For those who haven't yet seen The Imitation Game, it's about Alan Turing, a young computer scientist who invented a machine that broke the Nazi's secret Enigma code used during World War II. Although he is credited with being instrumental in ending the war, eight years later he was arrested by the British for being a homosexual. This led to his eventual suicide in 1954. Here is what Graham Moore told us during a Q & A after the screening. "His story, it all seems so unbelievable but it's not. Alan Turing did all of this, but because he was gay was prosecuted like a criminal which ultimately resulted in his suicide. We should be celebrating those who are different and what they offer. I went to Space Camp and computer camps as a kid. I was a nerd. 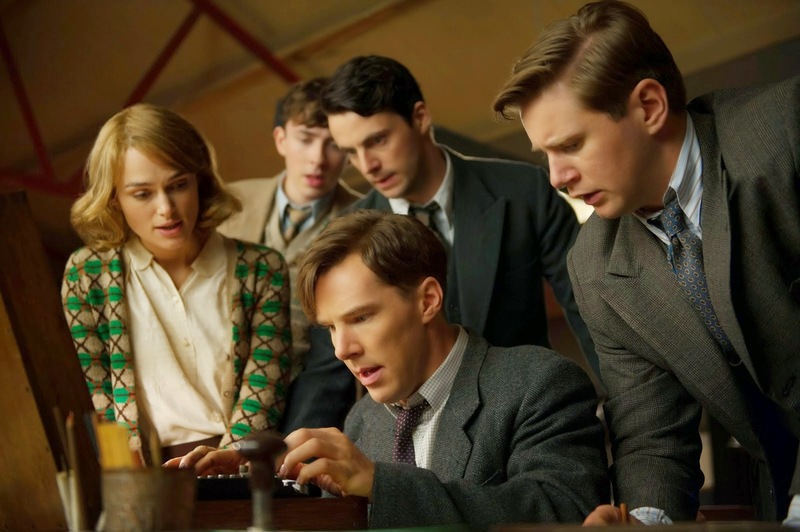 During this time I learned about Alan Turing and it made a big impact on me"
When asked how he was selected to write this screenplay he said, "My only writing credits previous to this were two shorts and one television episode. I was at a dinner party and I met a woman there who told me she had optioned a book about Alan Turing. I told her I would love to write the screenplay and was so excited I offered to do it on spec. My wild enthusiasm I think actually scared her! But they let me do it and in the end they liked the script and so we made the movie and of course I got paid then. It has been wonderful to be nominated for awards but it's most important to me that I was able to help tell the story of this brilliant and courageous man." Moving on to tonight's Oscars, the passion for sharing the story of someone who is different was evident in Graham's emotional acceptance speech for the Oscar for Best Adapted Screenplay. He said...."I tried to commit suicide when I was 16 and now I am standing here. I would like for this moment to be for that kid out there who feels like she doesn't fit in anywhere. You do. Stay weird. Stay different, and then when it's your turn and you are standing on this stage please pass this message along." I think there is another helpful lesson in Graham Moore's experience with this film, which is the fact that he wrote it on spec. Many times when we want to do something whether it be write, act, sing, launch a business or a head in a new career direction we wait for someone else to give us an opportunity. But we don't have to wait. We can just do it ourselves. In the process of creating and learning the opportunities will arise to forward our path. Will they all lead to something big? No, but some will and perhaps lead us to our goal or help us realize it's something else we want. As for me I know he's right because I have done this with a few different things in my life. The most recent being my blog. Nobody is paying me to do it. However, several opportunities have arisen from it that have accelerated my artistic and professional growth. Stay different, stay weird and do it on spec. Thanks Graham and congratulations on your Oscar! If you like Graham Moore you may enjoy his debut novel "The Sherlockian," which was a NY Times best seller.